The measured winter snow, maximum winter snow, net, and annual balances for 1997–2001 in the Gulkana Glacier basin are determined at specific points and over the entire glacier area using the meteorological, hydrological, and glaciological data. We provide descriptions of glacier geometry to aid in estimation of conventional and reference surface mass balances and descriptions of ice motion to aid in the understanding of the glacier’s response to its changing geometry. These data provide annual estimates for area altitude distribution, equilibrium line altitude, and accumulation area ratio during the study interval. New determinations of historical area altitude distributions are given for 1900 and annually from 1966 to 2001. As original weather instrumentation is nearing the end of its deployment lifespan, we provide new estimates of overlap comparisons and precipitation catch efficiency. During 1997–2001, Gulkana Glacier showed a continued and accelerated negative mass balance trend, especially below the equilibrium line altitude where thinning was pronounced. Ice motion also slowed, which combined with the negative mass balance, resulted in glacier retreat under a warming climate. Average annual runoff augmentation by glacier shrinkage for 1997–2001 was 25 percent compared to the previous average of 13 percent, in accordance with the measured glacier volume reductions. 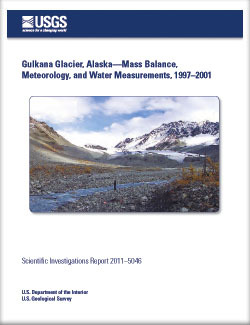 March, R.S., and O’Neel, Shad, 2011, Gulkana Glacier, Alaska—Mass balance, meteorology, and water measurements, 1997–2001: U.S. Geological Survey Scientific Investigations Report 2011-5046, 72 p.